Featuring nail head trim, bun feet, extra thick seat cushion with welt trim, and larger scaled roll arms for extra support, this stationary chair easily creates a timeless and traditional atmosphere in your home. Furnish your living room, den or library with this chair and put up your feet while you visit with family, read a novel or watch evening shows. 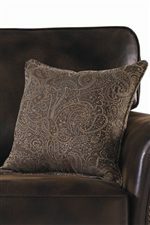 Enhance your decor with this comfortable chair in your home. 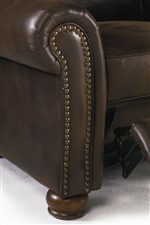 The Benson Stationary Chair with Nailhead Trim by Lane at AHFA in the area. Product availability may vary. Contact us for the most current availability on this product. The Benson collection is a great option if you are looking for Traditional furniture in the area.